While some chefs’ signature dishes are unsightly culinary car-crashes, others are actually quite enjoyable. 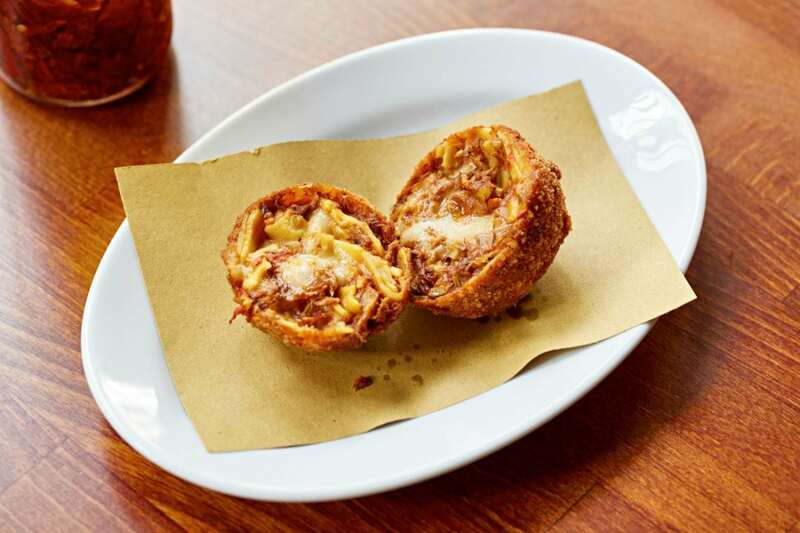 Jacob Kenedy’s (owner of Bocca di Lupo, Gelupo and VICO) signature – ‘lasagnacini’, for instance, is a playful hybrid between two Italian classics: lasagna and arancini – deep-fried risotto balls. Available at VICO in Soho, which was recently awarded a Bib Gourmand in the 2017 Michelin Guide, the dish is also possible to recreate at home thanks to this week’s featured recipe. This recipe makes about ten, but trust us, you’ll probably want to stock up on ingredients to make another batch as soon as possible. Break the nests of dried pasta roughly in your hands, set a pan of salted water on to boil and cook the pasta very al dente – a little undercooked even to your taste, and drain it. Mix it with the Bolognese. Spread it out on a tray, sprinkle with the cheese and leave to cool, then refrigerate. Mix the pasta up with your hands, divide it into ten portions. Form each into as tight a ball as you can manage, using your hands. If using the béchamel, put a tablespoon in the centre of each one. Dust the balls in the flour, then coat in the egg, then in the breadcrumbs. Deep-fry in vegetable oil at 160C for 10 minutes. Further information on VICO can be found at eatvico.com.